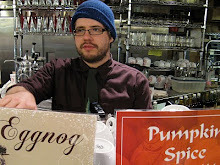 The Coffee Enhancement Lounge features common hours every Thursday. 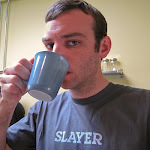 According to their web posts, "The Coffee Enhancment Lounge (CEL) is Seattle areas' premier coffee lab." Visions Espresso Service's CEL is analogous to a coffee community centre. The CEL features commercial quality equipment in a an environment that is open, often free and can be booked for private use. 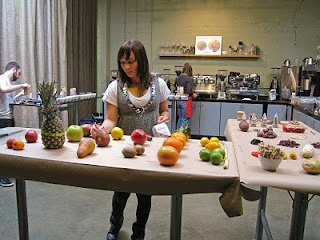 The brain child of Sarah Dooley, a long time Seattle Barista and organizer, the CEL has also been the site of the ongoing Barista Round Table Meetings. Front, Laila and Nick cupping. Today featured cupping and palette building exercises. Coined "Flava Wheel", presumably by Sarah, the event was describes as "...a hands on approach to the Coffee tester's Flavor Wheel..." A large of array of production roasted coffees we're accompanied by two tables of fruit, vegetables, nuts and chocolate. Sarah Dooley preps for pallet building. 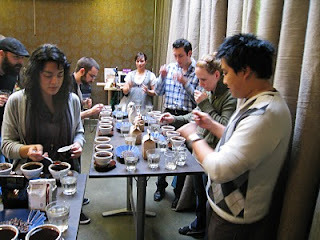 The environment was informal and the cupping table was stacked. 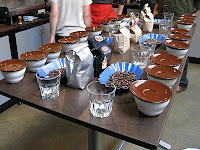 Stand outs included Veltons El Salvador Finca Alaska as well as StumpTown Kenya Gaturiri and Guatemala Finca El Injerto. Things wound down and we found ourselves eating the dried fruit and chocolate from the table. I must have eaten five dates. The conversation started with cupping notes and went toward cafe war stories, equipment tech, and industry gossip. 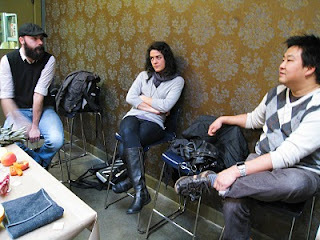 Talking shop with Rob Britt, Laila Ghambari and Nick Cho.